The only gear that can cannibalize all the other gears is long term care. It is also the gear that is most neglected and unfortunately, so many people’s plan for dealing with it is hope and prayer. Most people say “I won’t get that bad where I need a facility or a nurse to come in and help me” or “my family will help me with all of my needs”. Do any of these sound familiar? According to the U.S. Department of Health and Human Services almost 70% of those turning 65 years old will need long term care at some point in their lives. You need a plan. If you or your spouse need long term care today those facilities have an average annual cost for a semi-private room of $82,125 according to Genworth Financial. Then you need to figure in the annual increase for the care, as well as the costs for health insurance, deductibles, prescriptions, clothing, etc… Ask yourself how long your nest egg could last paying out $90,000 to $100,000 per year in today’s dollars. You can see how that kind of expense can be devastating on all you worked for. Of course, if you never need it than it is not an issue. Many people who can afford to might consider buying a long term care (LTC) insurance policy; which can be very expensive. Also, as with most insurance, if you never need it your family will not get your premiums back after you pass away. One alternative to just wishing and hoping or paying an expensive LTC insurance policy premiums are estate planning and asset based long term care. Estate planning needs to be done with a quality legal firm that specializes and can prove that they specialize in estate planning and elder law. There are far too many wrinkles and what if’s to contend with for this article; not to mention the various state regulations. Since the traditional financial world tells us to buy term insurance and not whole life most people will stop paying expensive term policies as they age because the cost becomes prohibitive. Thus when they are faced with long term care issues they must cannibalize their estate or reduce the estate before they have need of long term care. Another way to defeat the cost of long term care and maintain your estate is to allocate some of your funds into very specifically designed products that are built to help you with the cost of long term care without selling off or hiding your estate. This is known as asset based long term care and it might be as simple as taking some of your money and putting it inside of a properly structured annuity. Let’s assume you have some money but are nervous about losing it all if you get ill for an extended period of time. What if you took $150,000 and purchased a “long term care annuity*” where you were credited with a 3 to 1 benefit ratio? Your $150,000 buys you $450,000 of long term care protection if and when you need the coverage. Now you have a structure in place that will pay for several years of care. What if you never need the coverage and pass away at home in your bed? Then the $150,000 you allocated into that account will be part of your estate and given to your family plus a small rate of growth. Maybe only 3% growth, but remember you are not doing this for growth; you have other gears of wealth that are concerned with growth and returns. This is a long term care and estate play and nothing more. You sleep well at night, maintain control of your cash, and if you never need the benefit your family receive the money plus growth. Most people don’t even know these kinds of plans are out there but they are if you take some time to look. This is another reason many of our clients set up a high quality life insurance policy in their 40’s 50’s and even into their 60’s. This provides the estate guarantee they want for their kids and grandkids so if they need to sell off assets to pay for care they still leave behind a legacy for their family. The article discussing this strategy is here. With some planning in advance long term care does not have to be an estate killer. One of my favorite books is by Harvey Mackay called “Dig Your Well Before You’re Thirsty.” These words are even truer when dealing with long term care and your legacy. 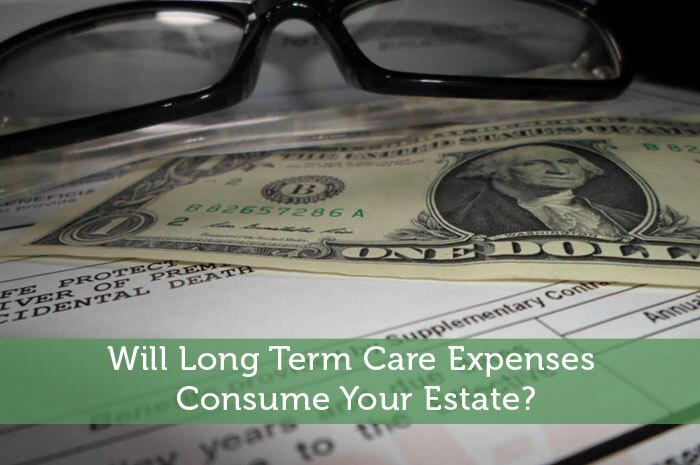 Will Long Term Care Expenses Consume Your Estate? John Jamieson is the Bestselling author of two books on finance and wealth creation. His latest book is entitled "Wealth Without Stocks or Mutual Funds" is available at the website above. John has trained thousands of people live all over North America on how to grow and protect wealth and incomes. He has been asked to speak by some of the biggest names in wealth education such as Donald Trump, Robert Kiosaki, and Robert Allen. He has also written dozens of articles both for online outlets and magazines. You can visit him at Facebook.com/perpetualwealthsystems.